If I'm out at a restaurant and I see the words "brie" or "caramelized onions," its a pretty safe bet that I'll be ordering that dish. I also really love mushrooms, so when Cara posted a recipe for Eggs baked in 'bellas, I was positively giddy. I added it to my menu, and planned to make it that Friday night. However, when the day came, all I could think about was pizza. So in a stroke of genius, I decided to turn the dish into a pizza! And since I'm pretty much obsessed with grilling pizza, it was obviously grilled pizza. And ohhh my goodness was this a good pizza. 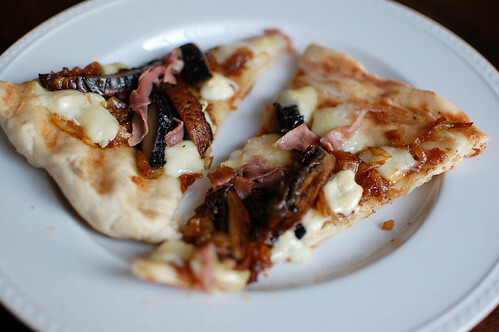 The magically sweet caramelized onions paired beautifully with the creamy brie, earthy mushrooms, and salty proscuitto. So so delicious. I served this with a strawberry spinach salad and a wonderful Oregon Pinot Noir, and we were so happy. I try not to be overly effusive in my descriptions, but this really was a truely magical pizza. I like to make something fun on Fridays, and it was perfect for a "date night" type of meal. I think it would also be great cut into squares and served as an appetizer. Heat butter and oil in a 12-inch skillet over high heat. When foam subsides, add brown sugar and salt. Add onions, and stir to coat. Cook, stirring occasionally, until onions begin to soften and release some moisture, about 5 minutes. Reduce heat to medium, and cook, stirring frequently, until onions are deeply browned and slightly sticky, about 40 minutes longer. As they cook, if they are sizzling and scorching, turn heat down. If they are still not browned at all after 15-20 minutes, raise heat. Off heat, stir in water, and season with salt and pepper. Prepare grill. Combine all the ingredients for the marinade, and brush the mushrooms with the marinade. Allow to sit at room temperature for 15 minutes. Grill, gill-side up, about 3-4 minutes per side, or until cooked through. Remove from heat and slice into 1/2 inch slices. Leave grill on. Roll out pizza dough, and brush one side with olive oil. Use an oiled paper towel to grease the grates of the grill. Transfer the pizza to the grill, laying the dough oiled-side down. Allow to cook until the bottom is crispy and lightly browned, about 4-5 minutes. While it cooks, assemble the toppings and have them ready. Brush the second side of the crust with olive oil, and flip the crust. Scatter the caramelized onions over the crust, then sprinkle the brie over the onions (You may not use all the onions). Arrange the mushroom slices over the cheese, and top with procuitto. Close the lid to the grill and cook until the cheese has melted, and the second side of the crust is cooked through. Remove from grill, slice and serve. I feel that exact same way about brie...I just can't control myself around it. And winter squash. If a menu has a savory dish with winter squash, you can bet I'll be ordering it. One day you need to post a tutorial on how to grill pizza dough. Try as I may to get it right, I never do. Michelle, I actually had Joey take pictures while I grilled this one to do a tutorial, but some didn't turn out. How about we have you and Evie over for lunch one day and grill pizzas then go to the pool? Maybe next week? I just tried this... and it is SOOOO good. I didn't have Brie so I used goat cheese. I'll definitely be making it again.